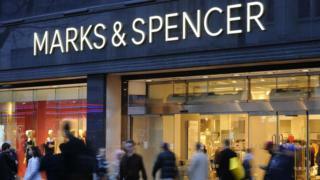 Marks and Spencer has suffered a big fall in annual profits following a costly store closure plan. Annual pre-tax profits fell by almost two-thirds to The expense of closing stores and revamping the business cost M&S ?321m in the 12 months to March.Chief executive Steve Rowe told BBC Radio 4's Today programme: "There has been a change in customer shopping habits and importantly a shift to online trading. "I said last year we would expect to have a third of our business online in the next five years. This is about making sure we respond to customers and where they shop in the future." How can M&S get back in fashion? He added that a rise in business rates had affected the profitability of some stores.However, Mr Rowe said that womenswear has gained customers for the first time in seven years.But despite that gain, sales of clothing and homeware slid 1.9% on a like-for-like basis, which strips out the effect of new stores.Like-for-like food sales also fell by 0.3% . Mr Rowe admitted that the company's distribution centre for its online business was not up to standard. "It is a difficult thing for us at the moment," he said. "It has failed in its customer proposition and that's not good enough at a time when customers want more merchandise delivered quicker."